We are very much delighted with the Leicestershire Police who did commendable work and took the case of Mohamed Ashriff to the Crown Court and ended the case with a successful conviction. The self-proclaimed spiritual healer has been found guilty of conning victims out of hundreds of thousands of pounds. Mohammed Ashrafi scammed 18 people in Leicester after targeting people with personal problems, illnesses or financial difficulties from a home in Babingley Drive in the city. A jury at Leicester Crown Court convicted him of 15 counts of fraud and one of blackmail after a three-week trial. Ashrafi will be sentenced later. The Indian Workers Association which was established in the UK in 1938 have actively campaigned over the years against this fraudulent practise, particularly since 1997 (as evidence Please See enclosed Leicester Mercury 30th July 1997). 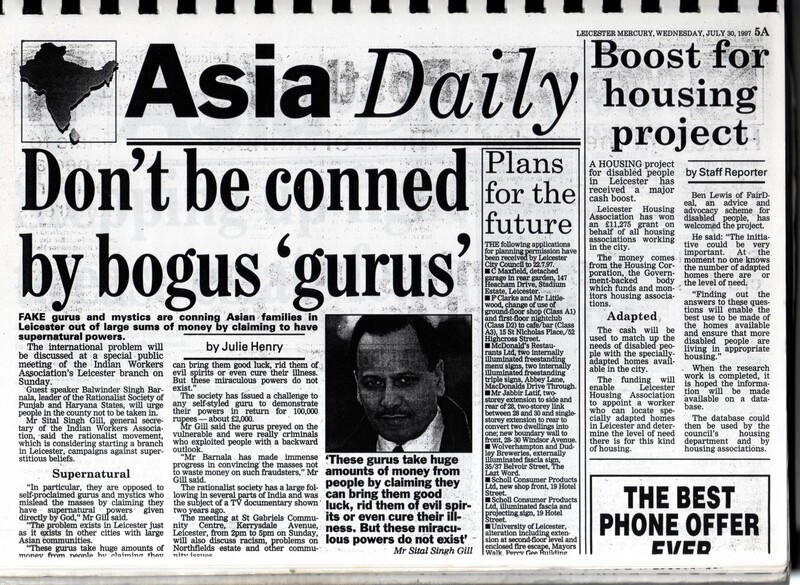 The UK IWA branches were horrified to learn that fake Gurus/Babas, fraudulent Faith Healers and mystics are conning mainly Asian families out of large sums of money by claiming to have supernatural powers which can be used to alleviate financial, personal health and marital problems. We have addressed many public meetings and set up many public debates on the radio shows regarding the matter and continue to do so. A written presentation was given during the meeting to the Deputy Prime Minister and Parliamentary Under Secretary of State for Communities and Local Government, Stephen Williams MP and was also sent to the UK Prime Minister. These fake gurus/babas are now well established in the UK and many others travel every season on visitor Visas from South Asian countries and make huge sums of money, almost always in cash. There is no accountability, no audit trail and no system of measuring a successful outcome. Those duped out of their savings are unable or unwilling to seek redress and rarely is a complaint made. It is very worrying. Thousands of pounds are taken on the premise that the fake Guru/Baba will bring them good luck, rid them of evil spirits or even cure their illness. Often the people who get taken in by fake healers are extremely vulnerable. Looking for any way to alleviate their suffering they are easily susceptible to false claims made by fake healers. The more vulnerable the person, the more money they are likely to be conned out of. Sometimes many thousands of pounds are lost to these people. These healers can be contacted very easily as they are advertising in newspapers, magazines and some TV channels. It’s difficult to stop them from advertising as they probably provide a good source of income for those that carry their adverts. This is illegal as they are falsely advertising their services according to UK Trading Standards Law, although, their adverts are also often carefully worded so as not to make explicit claims. However, individuals who have fallen prey to the scam and lost thousands of pounds could initiate legal action. This is where the police, Trading Standards and even Courts could be more robust in pursuing individuals. The difficulty is that most people are too embarrassed to admit they have been conned, and the more money they have lost the less likely they are to come forward. In addition, people don’t like their personal lives or situations to be exposed to the public. It can be very traumatic for people if this happens; it is just human nature to keep such issues confidential. It’s almost the perfect crime, where the perpetrator could spend decades cheating people out of small fortunes and never being held to account. Sital Singh Gill of the Indian Workers Association G.B. continues to request the UK Government to give extra powers to the Police, Trading Standards and other agencies to enable them to take tougher action against these fake Gurus and consider introducing targeted legislation. He is closely working with the Leicestershire Police and greatly thanks them in their efforts to raise awareness and combat this very serious issue affecting our local communities. The Indian Workers Association G.B. remains adamant that we will carry on our campaign against these criminals who are exploiting innocent British People.